You are at:Home»Herbs»Nigella sativa Linn. Latin name : Nigella sativa Linn. Description : It’s therapeutic use was initiated after the advent of Islam, since, Prophet Muhammad (Pbuh) mentioned its therapeutic efficacy and potential of cure. Hazrat Abu Hurairah States – “I have heard from Rasool Allah (Pbuh) that there is cure for every disease in black seeds except death and black seeds are showneez.” Salim Bin Abdullah narrates with reference to his father Hazrat Abdullah Bin Omar that Rasool Allah (Pbuh) said, “Let fall these black seeds upon you, these contain cure for all diseases except death.” The same narration is found in Sanad-e-Ahmed from Hazrat Aisha (t) and in Ibn-al-Jozi and Trimizi from Abu Huraira. Hazrat Buraida narrates that Prophet Muhammad (Pbuh) stated – “Showneez is cure for all ailments except death.” It is stated in the books of seerat that Nabi-e-Akram (Pbuh) himself used to take these seeds for therapeutic purpose but with the syrup of Honey. Seeds are considered antibilious, antiinflammatory, aromatic, carminative, diaphoretic, digestive, diuretic, emmenagogue, expectorant, galactagogue, resolvent, sedative, stimulant, stomachic, tonic and vermifuge. Used in allergies, colds and fevers. It is also useful in a wide variety of other diseases and conditions including bilious ailments, cancer, colic, corns, eruptions, headaches, jaundice, myrmecia, orchitis, puerperal fever, sclerosis, stomachache, swellings, tumors of the abdomen and eyes, and warts. The seeds contain beta-sitosterol – an anti-tumor sterol. They are very effective in curing abscesses and tumors of the eye, abdomen and liver. They also prevent from parasitic infections and treat skin ailments, such as eczema and boils. The oil is also used to prevent from the symptoms of common cold, abscesses and ulcers. 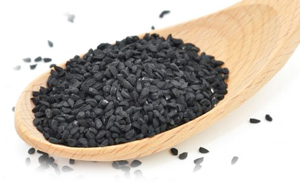 According to latest research Nigella oil has anticancer properties and is effective at healing some bronchial spasms, ulcers, abscesses and tumors. It can also be applied to the different parts of the body such as the head for headaches and migraines, in the ear forrelated problems, and for muscle and joint pain.